Contrary to what many might think, Cinco de Mayo is NOT the celebration of Mexican independence, which is celebrated on September 16th. Here in the good, ol' USA, we've crudely appropriated the military holiday as an excuse to drink margaritas and eat tamales and tacos. Although, it's also become an opportunity to celebrate Mexican culture, in general; so, it's not entirely about stereotyping. Cinco de Mayo is literally translated to the fifth of May, a date observed to commemorate the Mexican Army's unlikely victory over French forces at the Battle of Puebla on May 5, 1862, under the leadership of General Ignacio Zaragoza. France, then under the command of Napoleon III, had launched an invasion of our neighbors to the south, in a bid to establish a Second Mexican Empire. All told, 4,000 Mexican soldiers were greatly outnumbered by the well-equipped French army of 8,000, a force which had not been defeated for almost 50 years. It was a victory in the mold of David vs. Goliath. While France would eventually succeed in their bid, their control of Mexico lasted only three years before they were again expelled. This significant and improbable moral victory continues to be celebrated in Mexico with commemoration ceremonies and military parades. 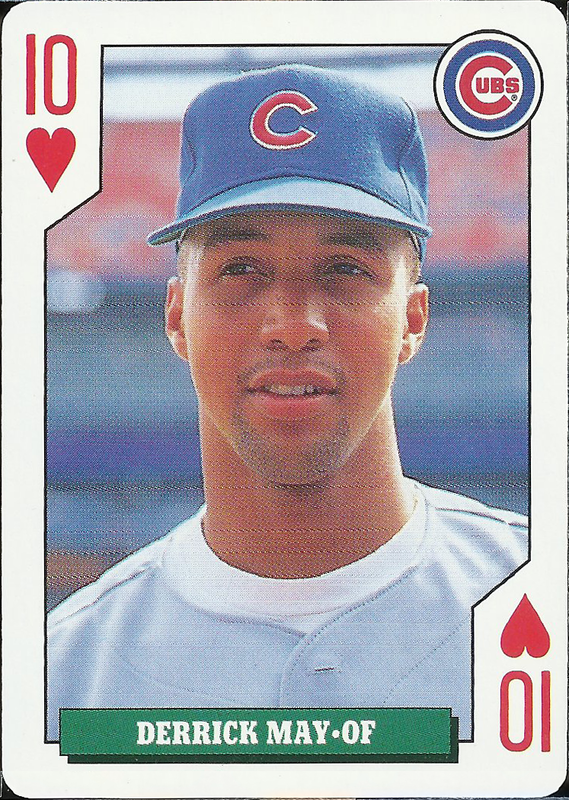 As in former Cubs wunderkind Derrick May. The outfielder was a can't miss prospect who would grow to lead the Northside ballclub into the promised land. Legions of card collectors in the early 90's hoarded the cardboard of the first round draft pick from 1986, in hopes that his rookie cards - like the Toys R Us oddball above, would eventually fund their college education or Malibu mansion. 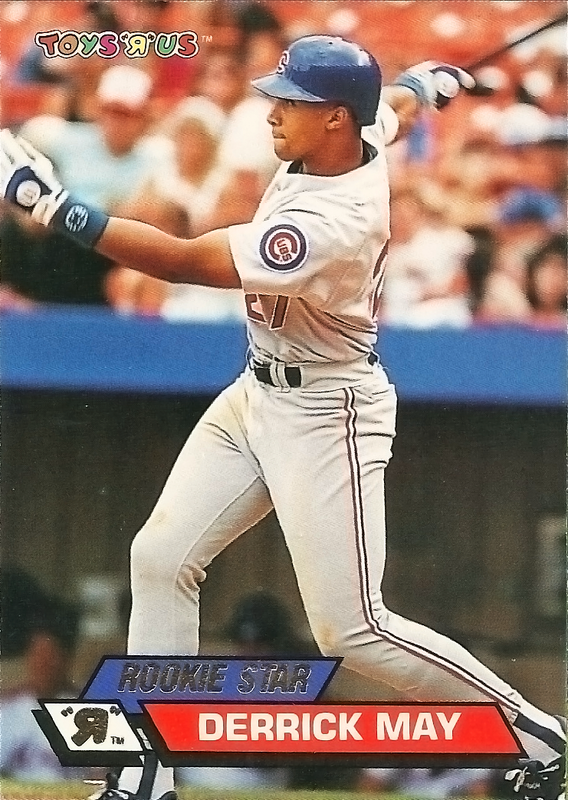 Unfortunately for them, Derrick May turned out to be much more like Corey Patterson than Kris Bryant. His power never fully developed and he turned out to be not much more than a singles hitter with some doubles ability. Like Corey Patterson, while he never transitioned from "sure thing" prospect to MLB superstar, May ended up having a long, ten-year career in the Bigs, which is certainly nothing to sneeze at. He was a bit of a nomad suiting up for five other clubs after being granted free agency just before the 1995 season. In the end, the son of longtime Major League outfielder Dave May ended up with a career 2.6 WAR, which is much better than your average bear. 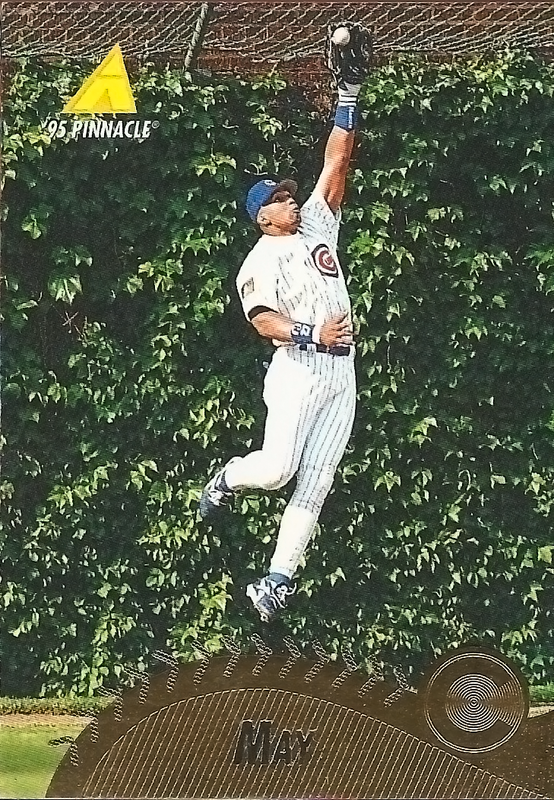 Plus, he managed to get some nice baseball cards out of the deal too, like the glorious leaping catch in front of the lush Wrigley ivy on the above 1995 Pinnacle single. Other than his last name just happening to be May, Derrick really has no connection to Cinco de Mayo. He was born in New York, went to high school in Delaware, and, until recently, worked in St. Louis with the Cardinals as an assistant hitting coach. 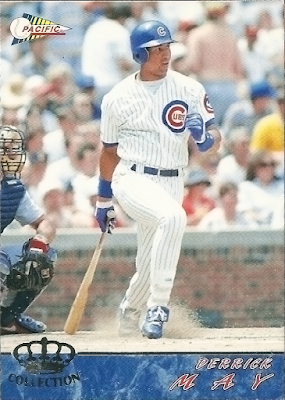 Although, after his MLB career had come to a close, he did briefly play in the independent, AAA-level Mexican League in 2000. With the Monterrey Sultanes, he posted a robust slash line of .320/.419/.549 with 8 home runs in 48 contests. That's the only connection to Mexico that I can make with Mr. May. 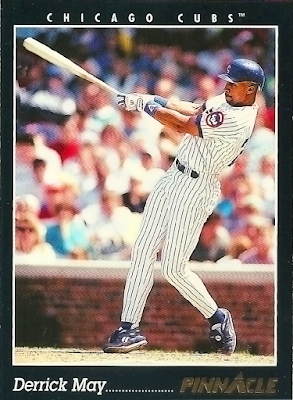 From there, he took his majestic swing, as captured on the 1993 Pinnacle, black-bordered beauty to Japan, where he plied his trade for three years with the Chiba Lotte Mariners. After 2003, May returned across the "Pacific" and began a long career as a manager in the Cardinals organization, leading several teams at multiple levels to postseason play. For his efforts, he was promoted to minor league hitting coordinator in 2011 and then eventually returned to the Major Leagues in 2016 as the assistant hitting coach for the Red Birds. After a reshuffling of the deck brought on by their lackluster '16 campaign, May was released and, as of now, does not appear to be actively working in the game. All in all, I think it's safe to say that Derrick has had himself a pretty nice career, despite commonly being labeled as a bust. We'll close out this Cinco de Mayo, "fifth of May" farce with a ten of hearts (¿diez de corazones?) 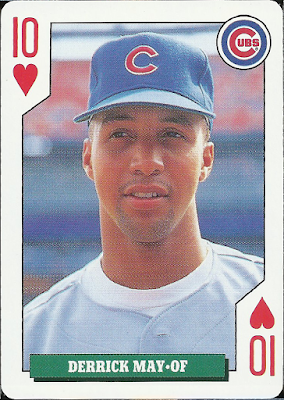 from the 1992 Bicycle "Rookies" playing card deck. 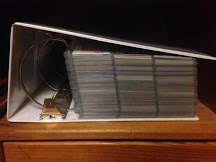 I could say something corny about how he must have loved the game for sticking with it so long or that it was his strong heart which kept him going all of those years; but, really, I just like the oddball card and wanted to include it in this silly post. 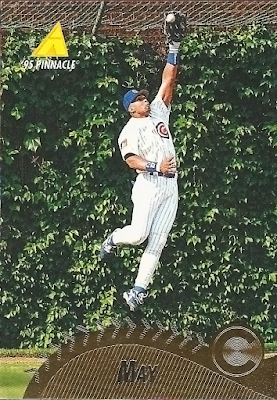 So, I started this blog entry lamenting how we as a country have culturally appropriated Cinco de Mayo to serve our own desires and continued on to appropriate it to fit my Cubs blogging needs. In the immortal words of one Bugs Bunny, "ain't I stinker?" I hope you at least got a tiny chuckle out of this "fifth of May" celebration. I have had this same post idea in my draft folder for a couple of years now and with my sporadic posting lately, I forget about it every time, haha. Good stuff!